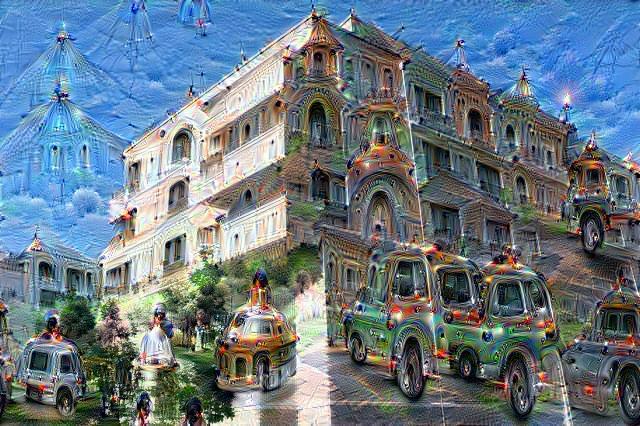 By their own admission, Google’s artificial neural networks have a strong bias towards pagodas, birds, insects and dogs. The recent net-glut of images which followed the release of the Deep Dream source code, revealed that artificial intelligence will emerge from a hallucinogenic horror-trip of unimaginable ghastliness. In an act of pedagogic gavage, a stack of unsuspecting software neurons has been force-fed twenty-three-jizzilion cached images from Google’s servers, given a mild sedative, and told to get on with it. If you are to believe psychonaut Terrence McKenna’s claim that human intelligence was given a metaphysical kick in the synapses when we began herding livestock, and consequently developed a culinary interest in psilocybin mushrooms growing in cow dung, this might equip you with a cyber-metaphoric framework for what Google have accomplished with software. 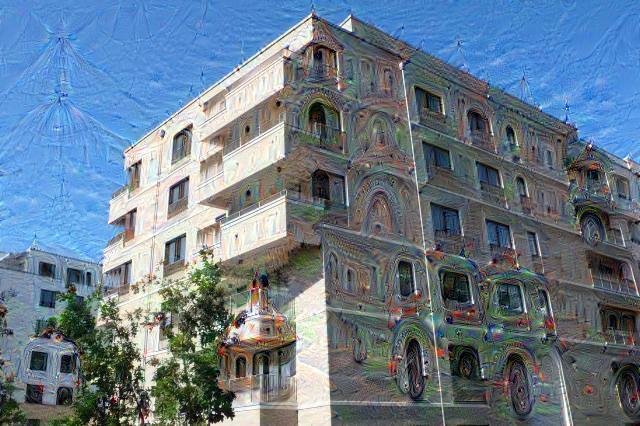 The lower balcony is displaying signs of heavily repressed pagoda, or vaulted-dome roof, and some kind of caravan has emerged from the building in the rear: a clear sign of underdeveloped mobility desires and perhaps claustrophobic tendencies. A row of taxis, morphed hideously together seems to be gathering before the door, and strange anthropomorphic figures congregate in the bushes. Paranoia and escapist fantasies dominate points of entry and exit. Delusional tendencies and primitivist fantasies expressed by conical, reed-roofing; turkeys blossoming from daylighting cupolas. Onset of delirium. Mushrooms coming on nicely now brothers and sisters. Full-on multiple-personality disorder; giant, lacy-winged creatures disg0rge from the heavens; roof cracks apart apart apart; six architectural epochs ’smerge with raw egg, spinach, inexplicable shifts in perspective radiance. Nuns. Rubber-coated chrome. Baby. lightning in blu Earth cleft asunder.